August can be slow for sports. John Tavares and Kawhi Leonard are still more than a month away from their respective Toronto debuts. The Blue Jays are an afterthought's afterthought. Football doesn't truly begin until after Labour Day. There is a void. Why not fill it with Canada's first national sport? This weekend, CBCSports.ca is streaming CricketFest Canada from King City, Ont. 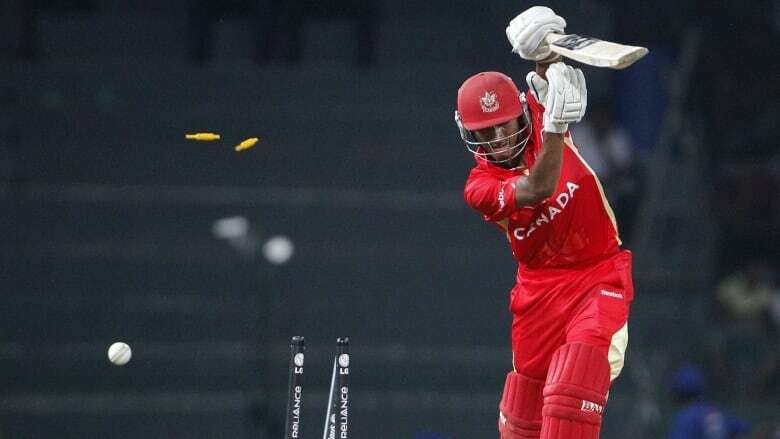 Four teams — Canada A, West Indies B, Cricket Canada national academy and Toronto Bears — will compete over three days and six Twenty20 matches. T-20 is the shortest version of the sport, with matches lasting just three hours. It's called T-20 because each side is limited to 20 overs. Overs are six consecutive balls thrown to the batsman by a bowler. A bowler may not throw back-to-back overs, but two bowlers can alternate. And yes, John A. MacDonald declared cricket Canada's first national sport during his tenure in office. Obviously, cricket has been far surpassed since the first Prime Minister's infatuation. But changes to the sport have made it much more enticing to the modern Canadian. T-20 is emblematic of these changes. Similar to rugby sevens, T-20 cricket is a high-octane version of a sport that is known to lag at times. The short nature of the game also lends itself to upsets and unpredictability. That brings us to Canada's A team. Seventeen countries are ranked by the International Cricket Council in T-20. Canada is not one of them. But after the top six, the competition flattens considerably. Qualifiers for the 2020 T-20 World Cup begin in September and Canada has its sights set on participation. CricketFest will serve as both a dress rehearsal and a tryout. Mike Haysman, one of four commentators on the broadcast at CricketFest, says the opportunity for Canada to play the Windies B side is crucial. "They need to play more cricket — there's no doubt about that," says Haysman. "They need to play against opposition which is exciting and the Windies B side is stacked full of exciting players." One of those players for Windies B is Sunil Ambris. The 25-year-old was recently added to the Windies A squad for a two-match test series against India. However, Ambris is better known for owning a piece of cricket history. In his international test debut in 2017, he became the first player ever to be dismissed hit wicket in his first appearance. Hit wicket occurs when the batsman knocks a bail off the wicket with his body accidentally. It's one of the rarer ways to be called out in cricket. Naturally, it happened to Ambris again in the very next innings (in cricket, a singular innings is still spelled with an "s"). Canada's players are considerably less notorious. Still, Haysman says that team captain Nitish Kumar exudes real potential. "He's one of the few players that I've seen in my commentary career that has the ability to step up into T-20 cricket without doing anything excessive with his technique," said Haysman. In T-20, since the game is so short, one batsman can exact massive influence on the game with a string of successful hits. Kumar possesses that quality. "He's been around for a long time and I'd really like to see him step up and take games by the scruff of the neck because he's very talented indeed," says Haysman. Kumar will seek to make his mark against the Canada national academy, a U-19 squad that includes many A-team hopefuls like Abraash Khan. Khan is still raw as a cricketer, but the prospect could play himself up a level with a successful CricketFest. Any measure of success either of the Canadian teams has against Windies would be both shocking and encouraging. The final team, Toronto Bears, is an all-star team of foreign players plying their trade in Canada. Haysman says that CricketFest, combined with July's Global T-20 tournament at the same venue, should continue to amplify the buzz of cricket in Canada. "The standard is gonna be good," says Haysman. "And the guys are gonna be trying like hell to impress."